Register and get 200 points free! Also, Earn points on every order! This two-handed sword has a long high carbon steel blade with a wide fuller traveling almost its full length. Features a regal lion’s face decorating the stone-shaped guard with an antique finish. The grip is wrapped with soft, blood-red leather. Comes with a matching scabbard. Overall 46-5/8”. This long flowing, fully-functional cloak is made of a heavy-patterned black brocade polyester fabric. The opening sides are lined with a black cotton velvet and sports twelve ornate antique buttons. This form-fitting pinstripe shirt is made of a poly-cotton blend. It features six antique silver filigree half-round buttons down the front, a large 7” lace-up cuffs, and shaped-tail bottom. A black polyester sheer sash included. This beautiful resin bust is expertly hand-finished to look like bone and antiqued steel armor. Horn is magnetic, to ensure non-breakage. This Steampunk style hat stands 4-1/2" tall and made of leather. Fully shaped and accented with antiqued silver studs. This hammer features a large end spike and small spikes on the sides. 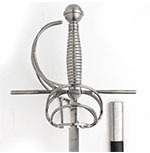 Head is attached with steel langets to the hardwood shaft which is also studded for a secure grip. Overall 26-1/2”. Weighs 2 lbs/4 oz. This axe is hand forged of darkened high-carbon steel with shredding edge. Features a wooden handle with leather cord wrapping and braided suede tassels hanging. Overall: 24-3/8"
This replica dagger has a triangular 1055 high carbon blade, a brass guard and cross-inlaid pommel. A leather-covered scabbard with matching brushed, antique brass tip is included. Overall 15-1/2 inches. Very limited quantities, so you better act fast! This, Three Forked Belt for Rapiers & Swords is made of heavy leather. Black with steel hardware. Accommodates scabbards 1-1/4 to 2 inches wide. Medieval shields came in various shapes and sizes. Museum Replicas offers an excellent collection of them. Full-color print catalogs for collectors like yourself! If you see something online for less we will match it! From professional demonstrations of our Swords to actual making of these swords and much more on our Museum Replicas Channel. 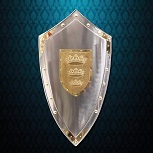 Visit our adventurous website, Atlanta Cutlery for a selection of unique knives, military swords, self defense tools and antique kukris. Visit Costumes and Collectibles, a repository of high-quality period, historical and fantasy clothing, accessories and collectibles.